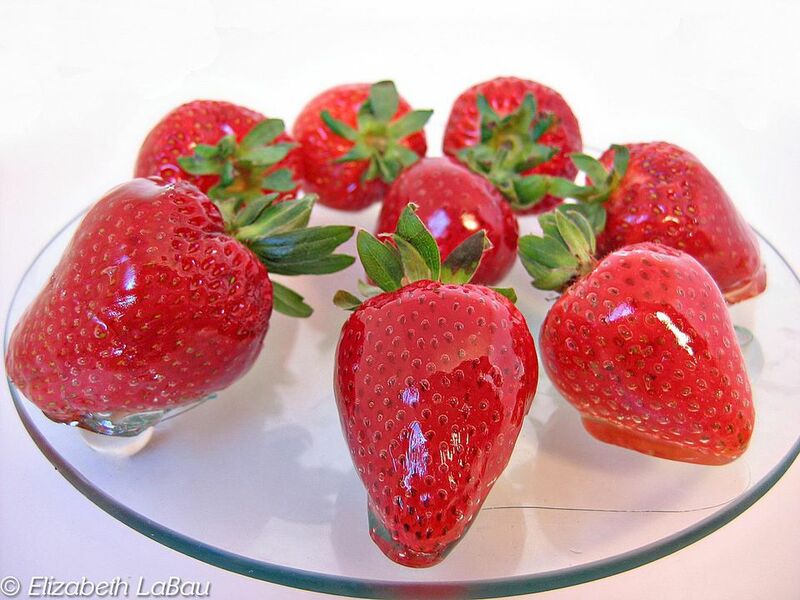 Glazed strawberries are fresh, juicy strawberries coated with a hard candy shell. These are an unusual candy, but once you taste them, you'll want to make them over and over again. What can you do with glazed strawberries? In addition to eating them on their own, they make a gorgeous addition to a fruit platter, fruit tart, cupcakes, or a berry cake. And you're not limited to just strawberries--this glazing recipe and method can be used to coat orange slices, grapes, kiwi, or a variety of other fruits! Prepare a baking sheet by lining it with aluminium foil and spraying the foil with nonstick cooking spray. Wash the strawberries and dry them carefully. Prepare an ice bath by placing ice and cold water in a bowl large enough to hold your intended saucepan. Continue to cook, without stirring, until the temperature reaches 300 F on the candy thermometer. During this process, which can take from 10 to 20 minutes, wash down the sides of the saucepan occasionally with a wet pastry brush to prevent crystallization. Once the candy has reached 300 F, remove the pan from the heat immediately, and immerse the bottom in the prepared ice bath to stop it from cooking any further. Do not let the ice water get into the candy! Once the candy has stopped cooking (look for the bubbles to stop rising from the bottom of the pan), you can begin to dip your berries. Holding a strawberry by the stem, dip it until it is almost submerged in the candy. Be careful not to touch the candy, as it is very hot and can cause dangerous burns. Remove the berry from the candy and allow the excess to drip off the end. Turn it a few times to ensure excess candy is removed, then place it on the prepared, oiled baking sheet. Repeat with remaining berries and candy. Allow the candy to set at room temperature. Be aware that this candy should be enjoyed within an hour or two of preparation, because the moisture of the fruit quickly makes the candy shell become sticky.